Canadian Eskimo dogs have been around since 1100-1200 A.D. and have aided humans in transportation, pulling sleds and simply becoming another member of the family. These two Eskimo puppies still showing off their puppy fur and characteristics, lay about enjoying the chilly weather of Churchill, Manitoba. 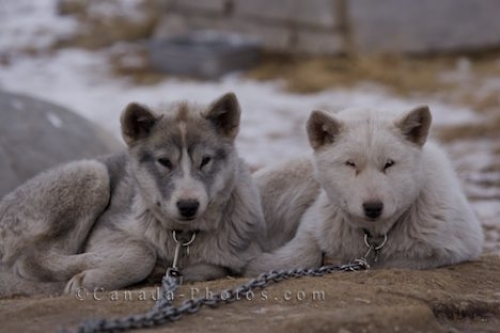 Canadian Eskimo Dog puppies, Canis familiaris, in the town of Churchill, Manitoba, Canada. Picture of two Canadian Eskimo Dogs resting in the chilly climates in the town of Churchill, Manitoba in Canada.